Thought Balloons - Creating Comics One Page At A Time: Why Taskmaster? Taskmaster is probably better known for his superpower of ‘Photographic Reflexes’, where he has the ability to watch someone do something and then replicate that action perfectly. Or even lets him know what moves his opponents are going to use next by reading their body language. But it could also be argued that his real power are his ‘super-senses’. As in his ‘business sense’ and his ‘common sense’. Because unlike most villains, Taskmaster isn’t in the business of petty crime, accumulating power, or swearing revenge on whatever heroes spoiled his last operation. 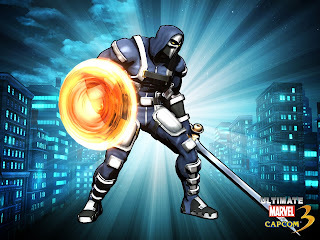 Instead, Taskmaster is more interested in making his living by more intelligent means. Such as training thugs for other villains who ARE in the business of petty crime and accumulating power. Or mercenary work. He’s not even opposed to working for people like SHIELD or the US Government if the reward is right (or if it gets him out prison time). Arguably, he’s not even so much a villain as being on whatever side of the law is most beneficial for him at that point in time. It’s just that more often that not, it’s more beneficial for him to be a bad guy. 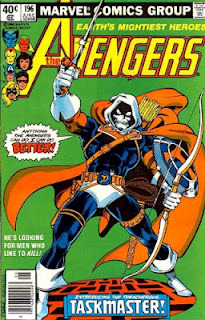 And that, I suppose, it the reason I picked him – because in a world full of villains who are looking to be on top of the world or get rich quick, Taskmaster knows better. And better yet, he knows full well there’s a market for folks like him who can profit from such evil schemes without taking on the burden for what happens when those evil schemes fail. It doesn’t hurt that he’s got a pretty kickin’ theme tune in Marvel vs. Capcom 3 – as YouTube will tell you, Taskmaster’s Theme Goes With Everything. And remember, folks at home: If you want to show us what you’ve got or even just have some fun, YOU TOO can play along at home by writing your very own one page Taskmaster-based script and posting it in the comments section below!